At least 26 Hazaras were shot dead execution sytle in an overly Baloch dominated area of Mastung/Luk-Pass area near Quetta - the provincial capital of Balochistan. Armed terrorists intercepted a bus enroute to Taftan (border town to Iran), singled out all Hazara men, and shot them dead. Terrorists reportedly stayed at the scene for 10 minutes firing with AK-47's to ensure no one survived. Sources from Quetta also report terrorists ambushing and killing several Hazaras who were rushing to the scene to ferry their loved ones to the hospital. Due to economic hardship, many Hazaras work as economic migrants travelling far from their families to work in remote location such as coal mines in Much (near Quetta), Taftan (border town of Pakistan to Iran), and some travel as far as distant cities in Iran such as Meshad and Tehran to find work. Mastung and Quetta city has recently become a hub of terrorists. The Wahhabist jihadi terror networks (Al-Qaida affiliates) responsible for the ongoing Ethnic-Cleansing of Hazaras are financed by Saudi Arabia and other wealthy Arabs, and enjoys full protection of the highest authorities within Pakistani Government. Saudi Arabia financed over 20,000 madrassas inside Pakistan all throughout Afghan War, much of whom are churning out extremits and suicide bombers at an alarming rate. The Hazara Democratic Party (HDP) has called for a global protest during the month of October and requested the Hazara community in the Diaspora, and all other peace loving people, to join together to highlight the plight of the Hazaras in Pakistan. HDP is holding Pakistani Government directly responsible for their criminal negligence and for helping the terror networks in their blood bath of the Hazaras in Pakistan. HDP has also pointed out several inconsistences in the statements of the Bus Company. For example, the person appearing as Bus Driver in several Pakistani media interviews is actually a 'munshi' (book keeper of the company). Bus was actually driven by the owner of the company, who has close ties to the Jihadi networks. In the first incident on this same coach company a while back, again, the driver was missing and the coach was then driven by owner's brother. In addition, HDP points out that the local people of Balochistan know each other by their features. The fact that the Hazaras were lined up, their id cards checked, and then singled out, may point to someone who is not local to Balochistan. The systemic manner in which people were lined up and inquired shows some level of law enforcement type of training. And the fact that some terrorists were still holding position for a second ambush of the loved ones rushing to the site, shows that they were in no hurry and perhaps may have gotten a green signal from law enforcement authorities. It should also be noted that No terrorists has been brought to justice despite the targeted killings of hundreds of Hazaras and over 500 others injured. In the recent past, several high value terrorists including that of Usman Saifullah Kurd and Dawood Badini -- brother-in-law of Ramzi Yousef (serving life in US), the master-mind of first attack on World Trade Center in 1993, reportedly "escaped" a high security prison located in the Army Cantonment area. Both of these terrorists are still at large. Recently, Terrorists have also increased brazen attacks on NATO supplies enroute to Afghanistan. NATO has alleged that Pakistan is either protecting or ignoring presence of high-valued Al-Qaida suspects living in the Quetta area. Members of Taleban Leadership Shura are also reportedly seen roaming freely in the Quetta area. The Lashkar Jhangvi terrorist network (mostly responsible for attack on Hazaras and Shias), an affiliate of Al-Qaida, has vowed to continue killing half a million Hazaras until they left the area. In an 2009 interview, the Interior Minister of Balochistan, Mir Zafrullah Zehri said: "he had clues about those involved in the target killings but he was helpless" pointing to the powerful shadowy security apparatus protecting the terror networks. The Inspector General of the police (the Highest Police authority in the entire State) has also complained that "whenever police arrested any criminal, he received calls from high ups for his release." 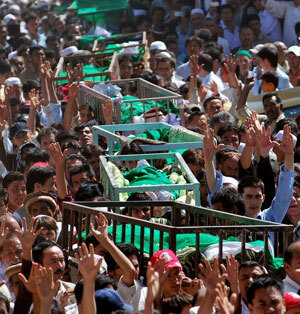 HDP calls for world wide protest by Hazara diaspora community starting Oct 1st, 2011.